ICS Financial Systems Limited (ICSFS), a global software and services provider for banks and financial institutions and a Gold level member of Oracle PartnerNetwork (OPN), today announced it has been selected as the winning partner for Oracle FY18 Middle East and North Africa – ISV Cloud Innovation. ICS Financial Systems was presented the Oracle FY18 Middle East and North Africa Innovation award in the presence of its peers and Oracle executives during the “Oracle Partner Day” on Tuesday, February 6th, 2018 at the Four Seasons Hotel Beirut. The award reflects ICSFS’ demonstration of skills and expertise by achieving the certification of its flagships; ICS BANKS Conventional, ICS BANKS ISLAMIC and ICS BANKS Digital Banking on Oracle Cloud Platform. ICSFS is one of the first Oracle ISV partners in the MEA region to adopt cloud technology and obtain full cloud certification – full market place registration – and has fully deployed its solutions on Oracle Cloud for production use to their clients. Also, ICSFS has been working closely with Oracle to incorporate the latest emerging technology services, including blockchain, artificial intelligence and mobile bots within ICS BANKS Digital Banking Platform. 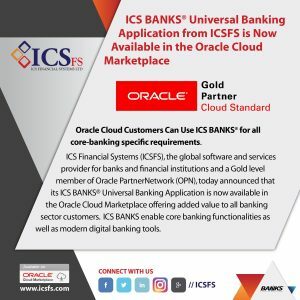 ICS Financial Systems (ICSFS), the global software and services provider for banks and financial institutions and a Gold level member of Oracle PartnerNetwork (OPN), today announced that its ICS BANKS® Universal Banking Application is now available in the Oracle Cloud Marketplace offering added value to all banking sector customers. ICS BANKS enable core banking functionalities as well as modern digital banking tools. Orange Jordan Deputy CEO/CFO Raslan Deiranieh announced that Orange Jordan has recently sponsored the “Digital Content Pioneers” inivitative, which was launched by the Information and Communications Technology Association (int@j) under the patronage of Her Royal Highness Princess Sumaya bint Al Hassan, and in partnership with the Ministry of Eduction and the Ministry of Communications and Information Technology. The initiative was hosted at the Business Innovation Growth (BIG) platform, with the presence and participation of the Minister of Information and Communication Technology, and the Minister of Public Sector Development, H.E. Mrs. Majd Shweikeh and the Minister of Education H.E. Dr. Omar Al Razzaz. 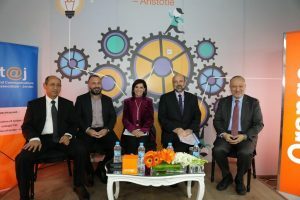 Deranieh added that Jordan has had a long experience in digital content production and in e-commerce, and since Orange Jordan is the provider of the strongest internet services in the Kingdom, it will always remain committed to supporting the driving forces of digital content production and e-commerce. The “Digital Content Pioneers” initiative which was launched by “int@j” aims to improve the status of the Arabic content in the digital economy sector, by developing the abilities of public school students in 10th and 11th grades across the kingdom, to help raise a generation that is capable of producing Arabic Digital content, that both meets their ambitions and serves the transition into the digital economy and its concepts, all while and improving the Arabic content on the internet, considering that there are almost 400 million Arabic-language speakers, since it is the fifth most spoken language in the world, to stay in line with the information revolution taking place around the world. The initiative will be manifested through a competition which will start next month, and it will consist of three phases, by the end of which the top three students across Kingdom will be honored as the initiative’s top performers. 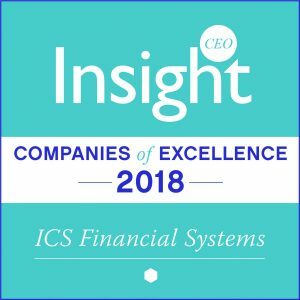 CEO Insight Magazine,the presenter of “CEO Insight Companies of Excellence”, have selected ICS Financial Systems Limited (ICSFS), the global financial software and services provider of ICS BANKS for banks and financial institutions, to be acknowledged and listed amongst the top 15 companies in its 2018 Companies of Excellence. “CEO Insight Companies of Excellence” list acknowledges enterprises that are at the summit of achievement in terms of excellence, influence and professionalism. These companies have a vision that shapes the conceptual landscape of inward investment, finance, business, technology, conferencing, design, architecture and law. “Technology rules the day and clearly ICSFS have their finger on their pulse when it comes to fin-tech. They have developed a first class product and service to rival anyone”. CEO Insight Magazine featured ICSFS’ digital banking revolution, stating that with the creation of the newest version of the ICS BANKS Universal Banking system, ICSFS is offering clients the integration of financial systems through the Open System architecture and in compliance with international Quality Assurance Standards ISO. This new version has many new out of the box built in features, of which: Business Process Management engine, Document Management engine, SOA architecture, Omni Channels and Digital Banking. Moreover, with the creation of a single digital banking multichannel platform, the aim is to provide safe and efficient interaction mechanisms between the bank and its clients via digital personal banking services such as internet and mobile banking, ATMs, kiosks, bank agents and open ICS BANKS Service Bus and middleware catalogue that insures seamless integration. تعلن شركة جلوبيتل، وهي شركة رائدة في توفير حلول الإتصالات المتكاملة وإدارة الزبائن، ختام مشاركتها في المؤتمر الدولي للإتصالات ٢٠١٨ الذي تم عقده في برشلونة وخلال المؤتمر تم انشاء علاقات جديدة وشراكات مثمرة وتفاعل إيجابي مع الزوار. ومع حضور سنوي يصل إلى ١٠٠,٠٠٠ زائر، استمتع فريق جلوبيتل في المؤتمر هذه السنة حيث استطاع الإختلاط مع الكثير من قادة القطاع وأصحاب الخبرة وزبائن جلوبيتل لتوطيد العلاقات. تم طرح حلول جلوبيتل الجديدة ومشاريعها القادمة مع الزوار في المؤتمر وتحدّث الفريق عن أهم تطورات السنة لمراكز الإتصال وشركات الإتصالات. تزامنت الأفكار الرئيسية التي تم عرضها في المؤتمر مع مواضيع ومشاريع جلوبيتل وتم النقاش عن إنترنت الأشياء وخدمات الجوال الإلكترونية والبنية التحتية لشركات الإتصالات وكيفية تطوير خدمات الLTE للتجوال الدولي والتحليل النصي للمكالمات وإمكانية جلوبيتل في توفير احتياجات الشركات لتحقيق أهدافهم والوصول إلى أفضل مستويات الخدمة. وقع القائم بأعمال رئيس جامعة اليرموك الأستاذ الدكتور زياد السعد اتفاقية لإنشاء وتشغيل مركز ريادة الأعمال والتأهيل الوظيفي في مجمع الريادة الأكاديمية للتميز بكلية الحجاوي للهندسة التكنولوجية بالتعاون مع مؤسسة ساغو الدولية للتدريب والتعليم، حيث وقعها عن المؤسسة رئيسها التنفيذي الدكتور المهندس ضرار شهابات. ويهدف انشاء المركز إلى توفير فرص تدريب لطلبة الجامعة والخريجين وبناء قدراتهم وتزويدهم بالخبرات العملية بما يؤهلهم لتلبية حاجات ومتطلبات سوق العمل، إضافة لرعاية الطلبة المتميزين وتوفير فرص عمل ملائمة لهم في السوق المحلي والخارجي. وأشار السعد إلى الخطوات الجادة التي اتخذتها اليرموك في مجال تفعيل التشاركية بين القطاع الاكاديمي والقطاعات الأخرى، بما يحقق التكاملية بينها، ويوظف الخبرات العلمية والبحث العلمي لتحسين واقع الخدمات المقدمة لأبناء المجتمع، وتقديم الحلول الناجعة للمشاكل والتحديات التي يعاني منها المجتمع. واوضح السعد ان اليرموك قامت بتحديث خططها الدراسية لكافة برامجها الدراسية بما يواكب التطورات المتسارعة التي تشهدها المجالات العلمية كافة، ويلبي حاجات سوق العمل الذي يتيح فرص التوظيف للمتميزين فقط من الخريجين، لافتا إلى أن المنظومة التعليمية متكاملة وتبدأ من الصفوف التحضيرية الأولى، مشددا على ضرورة أن تأخذ عملية اصلاح هذه المنظومة وقتها بما يكفل تحقيق النتائج الاهداف المرجوة. بدوره أشار شهابات حرص المؤسسة على تفعيل تعاونها مع جامعة اليرموك، وذلك انطلاقاً من مبدأ التعاون والشراكة بين القطاعين العام والخاص، وأهمية هذه الشراكة في دفع عملية التنمية المستدامة لمؤسساتنا الوطنية، لاسيما وأن اليرموك تعد من الجامعات الرائدة والمرموقة في كافة المجالات محليا واقليميا، ويحظى خريجوها بسمعة مهنية متميزة في مختلف مواقع عملهم. وبموجب الاتفاقية تتولى الجامعة عملية توفير الدعم الإداري واللوجستي والفني الممكن الذي تتطلبه طبيعة عمل المركز بما يسهم في نجاح فعاليات التدريب والخدمات المقدمة فيه للطلبة، فيما ستقوم المؤسسة بتقديم خطة تدريبية لعقد مجموعة من الدورات، وورش العمل المجانية للطلبة وبشكل مستمر، بالتعاون مع مجموعة من الاستشاريين والمتخصصين من سوق العمل، بما يعكس خبراتهم العملية بشكل مباشر للطلبة. كما تتولى المؤسسة تقديم الخدمات الاستشارية المجانية للطلبة وخاصة المتوقع تخرجهم، بما يساعدهم لدخول سوق العمل بشكل احترافي وتمييزهم فيه، وإتاحة الفرصة أمامهم للتواصل مع الجهات المشغلة للخريجين داخل المملكة وخارجها بقصد التوظيف، إضافة إلى تقييم مشاريع تخرج الطلبة ومساعدتهم لتحويلها إلى واقع استثماري يعود بالنفع على الطالب بعد تخرجه من خلال تأهيله بالمهارات العملية والتسويقية. وحضر تقيع الاتفاقية عميد كلية الحجاوي للهندسة التكنولوجية الأستاذ الدكتور خالد غرايبة، ومدير مجمع الريادة الدكتور عبدالكريم التميمي، ومديرة دائرة العلاقات العامة والاعلام بالجامعة الدكتورة ناهدة مخادمة، ونائب رئيس المؤسسة جعفر شهابات. 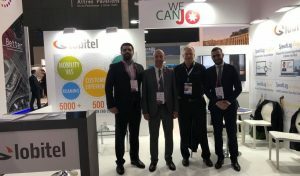 Globitel, the leading provider of customer care and telecom solutions, announces the successful conclusion of its participation in the 2018 Mobile World Congress (MWC). 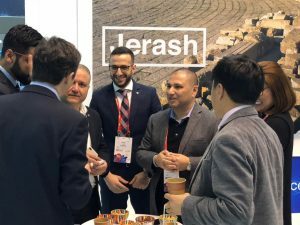 The 4-day event which took place in Barcelona has yielded new partnerships, successful networking, and positive reactions. With over a staggering 100,000 attendees this year, the team had a great time networking with different industry sector leaders and decision makers; highlighting with a lot of enthusiasm and pride Globitel’s newest solutions and social initiatives. The themes opened up lively discussions with visitors on the future of IoT, enhanced mobile digital services, operator infrastructure in terms of LTE roaming, billing, etc. Some more takes included AI chatbots, speech analytics, etc. followed by Globitel’s role in helping companies achieve these goals. 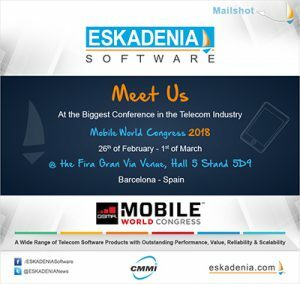 ESKADENIA Software, the leading Jordanian-based provider of world-class software products and services, will participate in the GSMA Mobile World Congress in Barcelona, the most popular and highly attended conference in the Telecom Industry. ESKADENIA Software will participate in the event as part of the Jordanian Pavilion and the extraordinary four-day event will be held from the 26th of February till the 1st of March 2018. During the conference, ESKADENIA Software sales staff and telecom specialists will provide live demos and presentations of ESKADENIA Software’s entire range of new Telecom Software Systems including the ESKA® CRM, Charging and Billing Systems. 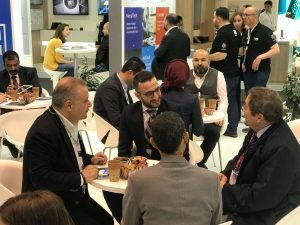 Additionally, the year’s show is an ideal networking opportunity for ESKADENIA Software and will help to open new opportunities and reinforce awareness of Jordanian IT products and expertise among the MWC audience. A number of Jordanian entrepreneurs and start-up owners will have the opportunity to participate in the largest Telecom-technology gathering in the world through the Jordanian Pavilion. There they will present their ideas and services, introduced their entrepreneurial companies to mobile operators and channel partners, and rub shoulders with international entrepreneurs and have the chance to discuss with them their latest technology innovations. The GSMA represents the interests of mobile operators worldwide, uniting nearly 800 operators with about 2,300 companies in the broader mobile ecosystem, including handset and device makers, software companies, equipment providers and internet companies, as well as organizations in adjacent industry sectors. 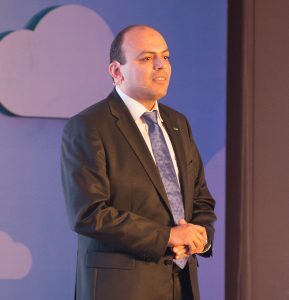 STS Cloud the leading hybrid cloud platform and the first of it’s kind in Jordan has announced that it has signed a new partnership deal with Qarar, the region’s leading decision analytics company. Headquartered in Dubai and serving customers across the Middle East and North Africa. As part of the agreement, Qarar and STS Cloud will provide the first of its kind virtual private cloud-based service that strengthens and automates the business decision making process within the banking and finance sector. The service will be hosted by STS and offered on its leading Hybrid Cloud platform and incorporate proprietary decisioning software provided by Qarar. The new service is primarily for use by retail banks, finance companies and other credit providers for the purpose of managing credit, customer management, risk, collections and recovery decisions for their customers. Qarar will provide and configure the SmartSuite Credit Risk Management software that underpins the service, delivered through the STS Cloud, offering banks in-country, secure and cost effective access to leading edge technologies. The partnership has been established so that organisations in Jordan can take advantage of technology expertise in a secure and local virtual private cloud environment, by strengthening the decision-making process and mitigate risk for the clients in Jordan. To enhance the working environment and internal information sharing . 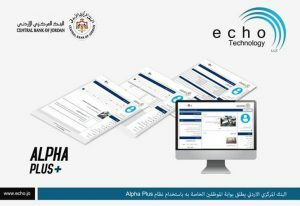 The Central Bank of Jordan launched a new Intranet Portal for his employees using AlphaPlus Platform.